Last year, Andrew and I worked together to look at which NHL playoff game was the most critical to victory in an NHL series. He built such a lovely database of playoff series that I just couldn't pass up the opportunity to take another look at the problem. Here you can see how each team's odds of winning the series go up or down based on how each previous game has gone. For example, if a team is leading 2 games to 1, their odds of winning the series are 69%. One important thing to note is that in this case it doesn't matter how they got there - there are three ways for a given team to get to a series score of 2-1 (count the lines if you'd like! 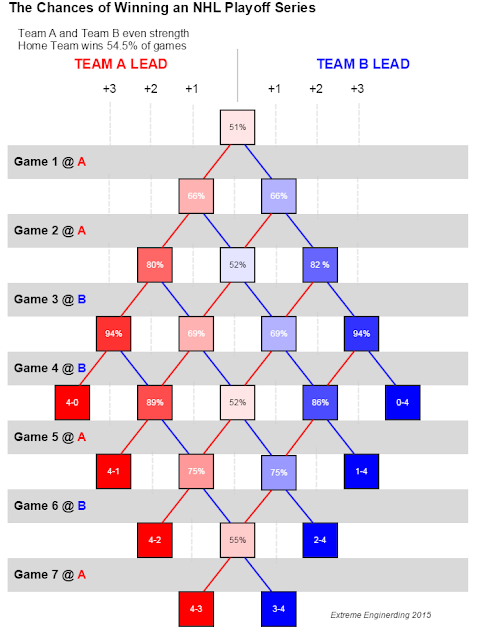 ), and they all lead to the same probability of winning the series. Also, note the symmetry in the diagram, since this model assumes both teams are perfectly even. At this point, asking which game is most important to win becomes a rather nuanced question. We may as well ignore any sudden death games as they're obviously critical, but which of the remaining games are the most important? Turns out, perhaps unsurprisingly, that the answer Game 5, but only if the series is tied. This game takes a team from a 50% chance of winning to 75%, cutting their opponents chances in half. This game has the single biggest change in odds one way or another. But lets face it, teams in the playoffs aren't likely to be even, and there's a well documented home-town advantage in hockey sitting at around 54.5% over the last few seasons. If we assume only a home-town advantage (but otherwise teams are even), how does that effect the playoff model? Surprisingly, it theoretically doesn't really change the teams' chances at the outset. In fact, the effect is rather diluted by frequently changing who plays where. This is probably good news, as it suggests that seeding order in the playoffs (which depends on teams' previous performance and is somewhat under their control) matters more in playoff series than winning home advantage. Some differences show up between this model and the previous one, though. If Team A wins the first two games in a row at home, they have a slightly lower chance of winning overall (because they had an advantage then anyway). If team B wins or ties the first two games, they have a slightly higher chance of winning overall, because it's relatively smoother sailing for them from then on. If Team A has tied the series up after game 4, they regain a slight advantage, because they have two home games against one. All in all these differences are rather minor. Here, Team A is both seeded higher than Team B, and has the home advantage. This results in a remarkably different set of probabilities than the first two models shown. If the question comes back to which game is the most influential, the answer once again is quite different than the previous models. The most critical non-sudden-death game for Team A is actually Game 4 - if Team A is winning then they increase their odds by 18%, but if they're losing at that point they increase their odds by 21% and regain the statistical lead. 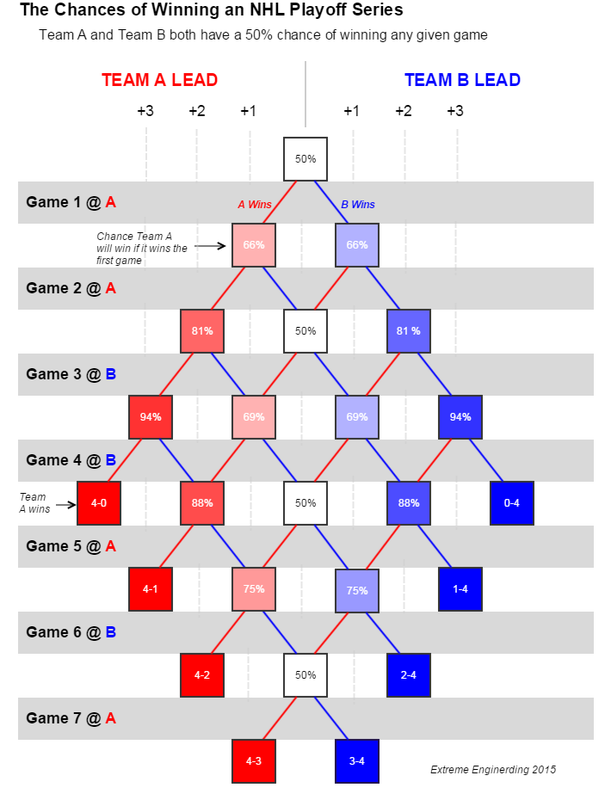 For Team B, the most influential game is Game 5, for the same reasons as in the 50/50 model previously discussed. It's important to note that model isn't necessarily applicable to the current Blackhawks v. Lightning Stanley Cup Final. Over half of all playoff series are from the first round of the playoffs, which until recently consisted of teams that were often extremely mismatched (as the top teams would play the 8th-ranked teams, etc.). It's not unreasonable to expect that the two teams who have made it to the Stanley Cup Final are more evenly matched than the average pairing in the first round, so I wouldn't necessarily recommend following along with the chart during this series. Don't forget to follow along with my NHL Playoff 2015 model and cheer on the Blackhawks (who I had picked to win right the outset of these playoffs! ).